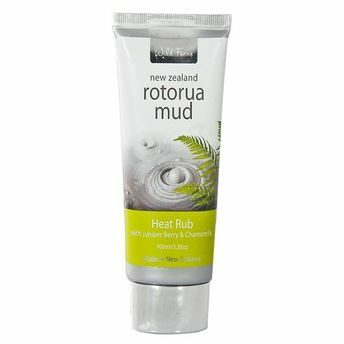 Containing geothermal mud from Rotorua, Wild Ferns Rotoraa Mud Heat Rub is a unique creme which has been specially formulated to provide gentle warmth and blood flow stimulation to relieve sore muscles and joints. It includes juniper berry extract to improve circulation and chamomile to relax muscles. Gently massage on affected area and enjoy the healing heat that helps ease away aches and pains.